We compulsive eaters are powerless against food. Once we take the first bite, we lose the power of choice in eating, as well as in many other aspects of our lives. We come undone when we eat compulsively, and our disease takes us on a nightmarish roller coaster we seem unable to step off of. That means that in OA we have many, many important choices to make to keep ourselves on the path of sanity, clarity, and serenity. Here are some of the most important of those choices that OAs face every day. 1. Am I choosing to acknowledge the truth about my food addiction? We food addicts are great at denial. We’ve been telling ourselves for years or decades that we’re going to get our eating under control any day now. That this will be the last diet program we ever need. That if we just exercised, the weight would come off. That our doctor doesn’t know what he’s talking about. That the aching in our knees or back aren’t caused by our weight. Deep down inside, we know the truth, but we don’t want to admit it. 2. Am I choosing to consider this a killing disease? So maybe we eat too much and can’t stop. So what? We’re probably just exaggerating the problem. We’re making too much of it. So maybe our A1C is nearing diabetic levels. Plenty of people live with diabetes. So maybe we’ve had chest pains from time to time. Could just be anxiety. So maybe we’ve wondered if life is worth continuing the way we’re going. Surely everyone thinks that at some point. A killing disease? Aren’t those OA people exaggerating? 3. Am I choosing to be in OA? There’s a difference between being a member and being in OA. Claiming membership is very simple, and our Traditions tell us that the only requirement for membership in OA is a desire to stop eating compulsively. Being in OA means we are fully engaging with the program as best we can given our level of experience. 4. Am I choosing to attend meetings? An old OA saying tells us that meetings are the first thing to go, and the food is the last thing to go. If life gets busy, are we making time to make meetings? Do we go even if we’re tired or would rather do something else? Those impulses to stay away one day at a time often indicate that we need a meeting much more than we realize. For newcomers unsure if they are in the right place or old-timers with only one foot in the door, our collective experience suggests that we might attend meetings until we are certain we are in the right place or until we are ready to drag the other foot back through into door. 5. Am I choosing abstinence? Abstaining from our binge/trigger foods is one of the big points of OA. But abstinence is more than what we eat, it’s our mindset about our eating. It’s acting one day at a time on the belief that we won’t eat no matter what, and no matter what we won’t eat. It’s also using OA’s 9 tools and letting the fellowship support our abstinence instead of going it alone. 6. Am I choosing to do OA’s 12 Steps? Many of us get scared by one or more of the Steps. We get hung up on the wording or hear internalize other people’s fear of them and stop in our tracks. But the Steps of OA are the program. They are what get us better. We must do them in order to recover, and they are not an a la carte menu. We do them, in order, and with the help of our God so that we can be well again. Without the Steps, we’re just doing another diet program. 7. Am I choosing to abide by and protect OA’s 12 Traditions? The Traditions are to meetings what the Steps are to individual members. They are a set of principles for action that allow our organization to function safely and sanely. They also arise out of experience, not out of someone’s fanciful ideas. If we want OA to be around for us, we need to abide by and protect the Traditions as those before us have done. If not, then we will repeat the same mistakes that led to their creation in the first place! We need OA healthy and thriving so that we can be healthy and thriving. So we ask ourselves: Do I know the Traditions? Have I studied them? Am I willing to stand up for them when it’s time? 8. Am I choosing to help others who still suffer? The most important person in OA is the newcomer. They are the lifeblood of OA. They also help our recoveries. When we help another, we get much of the benefit. Are we “too busy” to help someone? If so could that mean we are too busy to help ourselves? Self-sacrifice, as our OA literature reminds us, is part of this program. 9. Am I choosing to support OA by doing service? Let’s be honest. Service is an issue in our area. Are we raising our hands, volunteering to do service of any sort when the call is issued? Do we speak when asked? Do we carry the bag or the key? Do we do the honor of serving our group as an Intergroup rep? Do we act as speaker seeker or treasurer for our meeting? Do we volunteer to support initiatives at the Intergroup level? We each have many helpful skills and talents that might support any number of helpful OA opportunities to carry the message to still-suffering compulsive eaters. We might ask ourselves why aren’t we doing service? What fear or resentment keeps us from saying yes? Why might we be content to let a small number of others do the work of OA for us? OA is a program designed to help us make better choices with our food and our life. And these nine choices we make every day are crucial to our recovery. 2014 is SeacoastOA’s Year of Abstinence. 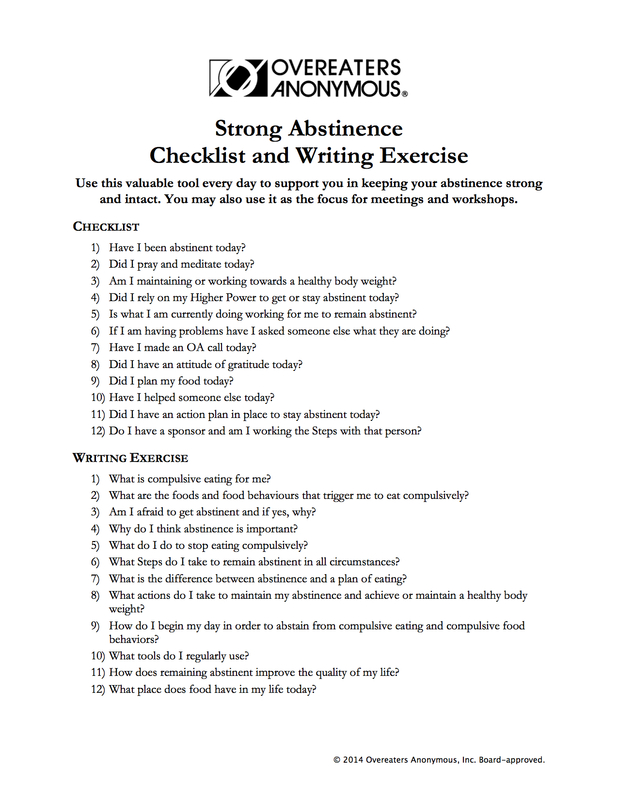 As if on cue, OA World Service recently passed along an excellent tool, the Strong Abstinence Checklist. Click the link to download a printable PDF. The Strong Abstinence Checklist includes twelve questions that remind us of the actions we can take to get and keep our abstinence. It also includes twelve questions for written reflection. Use one of its questions as the topic in a discussion-format meeting. This checklist has been added to our website and can be found on our Recovery Resources page. Please feel free to distribute it at your meetings—it is OA approved.